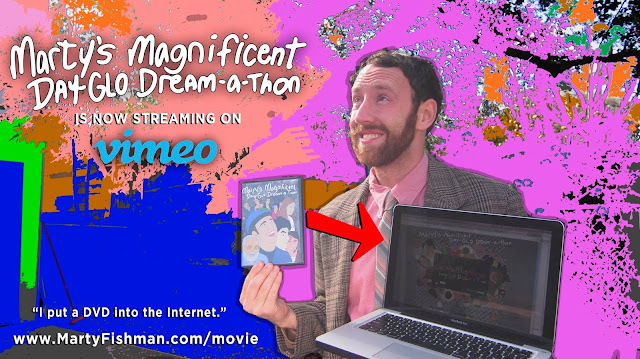 Marty's Magnificent Day-Glo Dream-a-thon, the film that started it all, is now streaming for the FIRST TIME on the internet. After many hours of inserting the DVD into his computer, Marty figured out how to transfer the movie into "Internet Format." Since the film was shot on multiple cameras with multiple frames rates, the film has been preserved in DVD format only. Traditionally, editing programs don't allow you to make a timeline with multiple frame rates (23.98 and 29.97 frames per second are common in the video world). Now with the addition of Black Magic H.264 Encoder, Marty Fishman Productions has finally been able to transfer the film to a High Quality Quicktime file. Enough nerd talk. Enjoy the movie. The film can be streamed on VIMEO or directly on our SITE.